Protesters gathered in Ipswich CBD on Saturday to demand the federal government ban live export of cattle to Indonesia, with chants of “We want live exports banned” and “Shame on Gillard”. Local stud owners and meatworkers joined the protest to oppose live exports – although meatworkers’ concerns seemed more with employment opportunities than animal welfare. Organiser Dr Patricia Petersen said banning the trade would see the Ipswich economy flourish. “We need to protect our jobs and we need to protect our local economy,” she said. Meat company Swift Australia employee Anthony Tupper of Ipswich said a ban would mean more local jobs. “When we have exports it means less work for us. Our shifts sometimes get cut down to two or three days a week,” he said. RSPCA representative Mr Michael Beatty said millions of dollars had been given by cattle growers to LiveCorp to improve the conditions in Indonesia but after 18 years nothing had been done. “We believe in the right of any animal to be killed humanly,” he said. Dr Petersen said Ipswich was the first to protest because the concerns of Ipswich are specific. “We have one of the largest meat processing plants in the southern hemisphere, for us this is our local economy at stake,” she said. Dr Petersen set up the Animal Welfare Society at the University of Queensland in 1994 to stamp out live export. She encouraged people to attend the national protest on June 18 at Parliament House in Brisbane. Your article headline and content suggests this protest was more about jobs than the animals welfare. I was at this protest, yes there were meatworkers there, 3 who acknowledged this when asked for a show of hands by the Channel 2 reporter, but the majority of us were just normal everyday people, not conected in anyway to the local meatworks, we were there protesting about the cruelty being done to the cattle exported live from Australia. I will be protesting again tomorrow, in Brisbane. Others will be other protesting in captial cities and regional centres across the nation!!!!!!!!!!!!!! 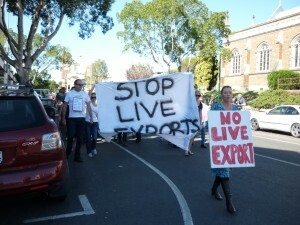 STOP LIVE EXPORT !!!!!!!!!!!!!!!!!!! !